A wide variety of York College of Pennsylvania drinkware to hold hot and/or cold beverages for at home or on the go. Enjoy refreshing beverages with our 16 oz. travel mug. Endure 17oz stainless water bottle with vertical York College logo on the front in fashionable marble and rose gold colors. A cool and fun 17oz. water bottle. 10oz Tumbler is sized to fit in your Keurig coffee machine, your car, and discretely in your bag. Keeper Kup is vacuum insulated to keep your beverage hot 5+ hours and cold 10+ hours. 24oz double-walled acrylic tumbler with colored sleeve and white York College imprint. 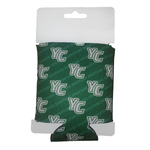 Can koozie for 12oz cans with repeating YC logo. Glass mug with Flag design above York College. Perfect for the Spartan veteran in your life. Split color York College design. Neil Enterprise 20oz Speckled travel mug features a stainless steel inner and outer coating and the double wall construction keeps drinks hot or cold for up to 6 hours. .75 Liters waterbottle with a screw lid and spill proof bite valve sipper. 18.5oz wine glass featuring the York College of Pennsylvania logo etched into the side. Neil Enterprises Woodsy 20oz tumbler with YC imprinted on the front. 25oz Sports tankard with York College Pennsylvania Spartans imprinted in green on the front. 11oz White mug with a green imprint of York College. Nordic Co. Napa 25oz Water Bottle features 8 flat sides for a comfortable grip, stainless steel outer wall, a copper coating on outside of inner liner, no sweat for dry hands.